WataugaWatch: Wells-Fargo to McCrory: Can You Spell "One-Term Pat"? Wells-Fargo to McCrory: Can You Spell "One-Term Pat"? 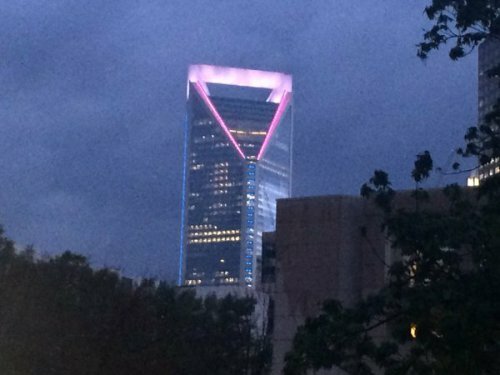 Wells-Fargo not only signed the open letter to Governor McCrory demanding the repeal of North Carolina's new anti-LBGT law (HB2), but the huge corporation also recently lit the 48-story Duke Energy Tower in Charlotte in pink, white, and blue, the colors of the transgender solidarity movement. After Charlotte passed an ordinance that provided public accommodations protections for transgender people, Lt. Gov. Dan Forest and House Speaker Tim Moore called an emergency session of state lawmakers. Within 24 hours, legislators from both chambers passed the vehemently discriminatory HB2 law, and Governor Squishy signed it late that same night. Too bad the few islands of reason in North Carolina, including Charlotte, Boone and Asheville, have to constantly pay the price for our degenerate State government, but until we can get rid of the Jonathan Jordans and Franklin Graham automatons such as Soucek and his successor, we will continue to be on the wrong end of the stick. To Wells - Fargo: Can you spell 'money launderer' ? To be fair, Wachovia was doing the money laundering. Wells Fargo just bought them. Wells Fargo was involved also.